Important dates for the 2018-2019 year. Moving into either Steinman Lofts or North Market Street Apartments? Complete the form HERE to select your move-in times. 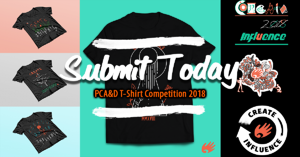 Don't forget to vote for your favorite T-Shirt design! ♦ Please complete, sign and return the below waivers to Orientation on Tues., Aug. 28th. All PCA&D students are required to update their phone number and local address through the MyProfile tab on the MyPCAD Portal. Please take a few moments to access the “Addresses” and “Phone Numbers” links found on the MyProfile tab after logging into MyPCAD. This information will allow the College to configure the PCAD Alert System to provide effective timely information in case of weather or safety incidents. Need a place to store your supplies, books and personal items? Then register for a locker. Lockers are 15″(h)x12″(w)x23″(d) and are free to use during the academic year. Students will need to provide their own combination lock. To register for a locker, please go to the PCA&D Locker Assignment Registration Form. Lockers are assigned on a first come, first serve basis and can be accessed during normal building hours. If you are commuting to campus and would like to park near campus, PCA&D contracts with the Water St. Garage to provide student parking. To register for a parking pass for the academic year, please go to MyPCA&D. Once logged in, click on the “Finances” tab. Under this tab you will find a registration form for parking. Please complete the parking registration form and follow the instructions for submission. Please watch the four Pre-Orientation videos and complete the accompanying short quizzes or tasks. Details and the password to watch the videos will be sent to your PCA&D e-mail on Monday, August 13th. Please complete, sign and return the below waivers to PCA&D during your respective Orientation session on either Tuesday, August 28, or Thursday, August 30. Need a place to store your supplies, books and personal items? Then register for a locker. PCA&D offers a variety of lockers throughout campus, which can be accessed while the building is open. Lockers are 15″(h)x12″(w)x23″(d) and are free to use during the academic year. Students will need to provide their own combination lock. To register for a locker, please go to the PCA&D Locker Assignment Registration Form. Lockers are assigned on a first come, first serve basis. You’re almost there. The first day of classes is right around the corner and we cannot wait to see you on campus. In reflecting about your experience thus far with PCA&D and what your hopes are for the future, please complete our Incoming Class Survey. We will be using some of the results from the survey during Orientation, so take this survey prior to your Orientation session. Also, new students that complete the survey will be entered into a drawing to win some sweet PCA&D prizes! Take the Survey here: http://bit.ly/PCADIncomingClass2018. If you are commuting to campus and would like to park near campus, PCA&D contracts with the Water St. Garage to provide student parking. To register for a parking pass for the academic year, please go to MyPCA&D. Once logged in, click on the “Finances” tab. Under this tab you will find a registration form for parking. Please complete the parking registration form and follow the instructions for submission. If you are living in Steinman Lofts or North Market St. Apartments, please consult with the Coordinator of Student Life and Housing, Jessica Steigelman, before purchasing a parking pass at the Water St. Garage. There are other parking opportunities for you near your residence. You will be setting up your laptop to access the PCA&D wireless and PrintClient network for transfer students on Tuesday, August 28th and Thursday, August 30th for foundation/foundation transfer students. Also on your Orientation date, you will signing you up for PCA&D's employment and career portal, Network to Success. For foundation and foundation transfer students, you will also need your laptop on Friday, August 31st for the Mock Classroom Session. Comfortable Shoes On Friday, August 31st, there will be a tour of the City of Lancaster. Comfortable shoes are advised for this walking tour. PCA&D is committed to providing students who have disabilities with an equal opportunity to fully participate in its courses, internships, programs, and activities. Students of PCA&D who have a disability and need accommodations in order to attain equal access must register with the Dean of Student Services. To view the Students with Disabilities Policy and/or request accommodations, please email jedonick@pcad.edu. Academic Calendar: Important dates for the 2018-2019 year.